Name the choral conference, festival, convention or event … wherever choir conductors gather, we love, love, love to share repertoire! Of course we enjoy the concerts, workshops and rehearsals but that’s just the start. A big choral event is also the opportunity to share meals and time with old and new friends, including conversations about new scores and composers! So, for this article I invited a variety of conductors to answer the following: what three scores would you recommend to another choral colleague, and why do you recommend these scores? What a joy to receive their enthusiastic replies! Since many of these scores have respectable performances on YouTube, I have also created a ‘playlist’ for you there as a way of engaging some of these recommended pieces (http://bit.ly/ICBthree). All scores cited below are a-cappella unless noted otherwise. So, pull up a chair and sit down for a conversation with 16 choral colleagues from around the world! Five Ways to Kill a Man (text: Edwin Brock; ttbbb + percussion, Oxford Univ. Press). Edwin Brock’s chilling poem about the environment is gorgeously set by Bob Chilcott in a way that really brings the words to life. Last Letter Home (text: Pfc Jesse Givens; tbb; Schott). The deeply moving “last letter” by Pfc Givens brings home the heartbreak and manifold effects of war in a poignant setting by Lee Hoiby. Dostoyno yest (ttbb, a cappella, Musica Russica). 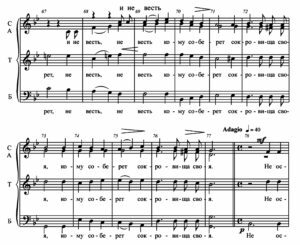 Golovanov is my favorite “undiscovered” Russian composer of music for men’s voices, and this setting of an Orthodox prayer is among his most beautiful pieces. Скажи ми, Господи, кончину мою / Show Me, O Lord, Life’s End (text: Psalm 38/9; ssattb; score inquiry: inesminsk@tut.by). This is heartfelt and deeply personal score with a powerful story. In 1967, this self-taught composer tragically lost his beloved wife, and was subsequently inspired to write the music for her funeral liturgy. Скажи ми/Show Me was a part of that larger mass and was a favorite of many listeners and singers. А хто там iдзе? / And who goes there? (text: Yanka Kupala; ssaattbb; http://andreimdivani.com/en/ or e-mail: mdivani@tut.by). 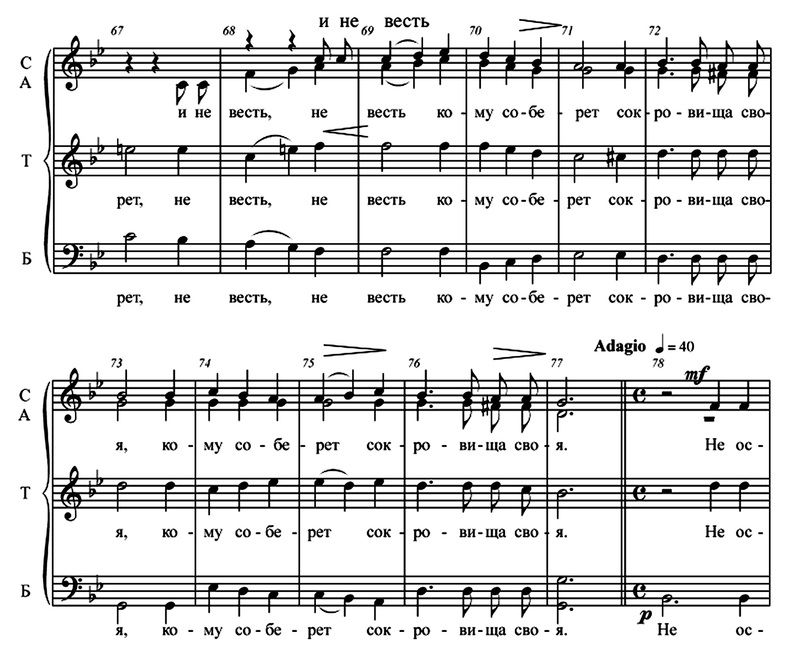 In the deep drama of this score’s poetry and music lies the bitter truth about the difficult history of the Belarusian people. Каравай / Loaf (text: folk; satb; score via composer: http://litvinovsky.iatp.by/bio.html or e-mail: litvinovsky@tut.by). This score’s textual and musical rhythms create the atmosphere of pagans casting a fiery incantation (spell) on a loaf of bread. For humans, ‘bread’ can be imagined as both a physical and a spiritual ‘food.’ Thus, the double meaning of this score. 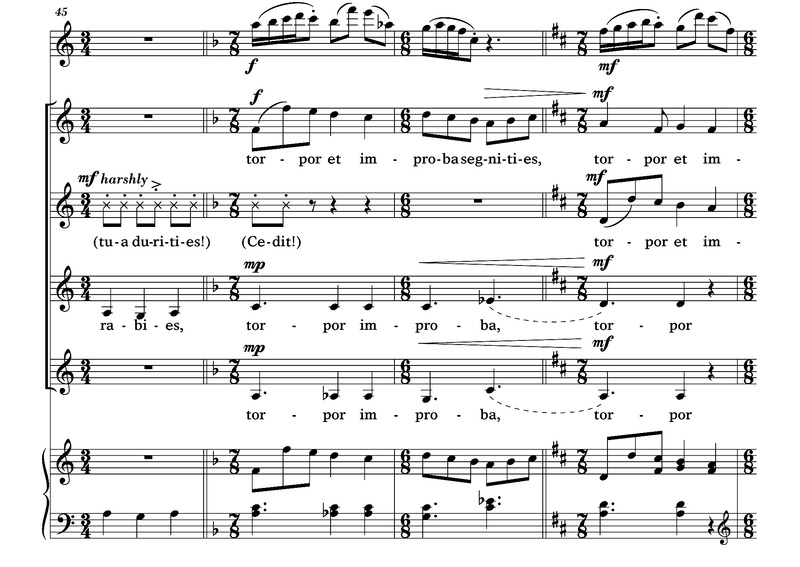 Ave Maria (ssaa divisi; score: http://bit.ly/gRXiQg). 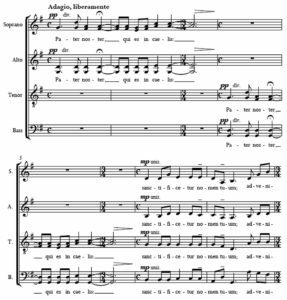 Ave dulcissima Maria (ssaa divisi; score: choral@telus.net). Quatre Petites Prières de Saint François d’Assise (ttbb; Salabert #5382). Nigra sum (ssa, keyboard; Tetra/Continuo Music TC-120). Lux Aeterna (satb; Ediciones GCC; http://bit.ly/MorujaLux). I love the beautiful peace of Moruja’s score: calm, tranquil, serene, transcendent. This music embodies peace. Segredo / Secret (text: Martín Caeiro; satb; http://www.bustovega.com). I love Caeiro’s poem. And the atmosphere created in Segredo transports you to mystical, magical Galicia in northwest Spain. The use of fifths gives the piece not only a medieval flavor but embodies the Celtic essence of this region. Miserere mei Deus (ssatb x ssab; http://bit.ly/AllegriMis). The ‘spirituality’ of this piece is extraordinary, and I like the story behind the score. It was written for Holy Week liturgies in the Sistine Chapel, and could not be copied or loaned under penalty of excommunication. When 14-year-old Mozart heard it, he went home and transcribed the entire score by ear, as if to say, “You don’t want to give it away? That’s ok, I’ll do it!” Thus, the privacy of the score was broken and we have the piece to sing today. Ave Regina Coelorum (sa and basso continuo, www.primalamusica.com). 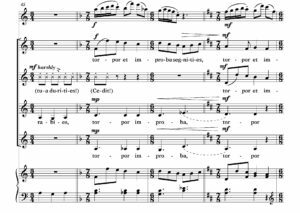 I’ve just discovered the amazing vocal lines of Legrenzi and although this score was originally for solo voices, it’s fabulous for choir. Cedit, Hyems / Be Gone, Winter! (text: Prudentius & Carmina Burana; ssaa, flute, G. Schirmer). Abbie’s music is fresh, challenging, well-crafted, and speaks to performers and audience alike. Da Pacem (ssaa, Cypress Choral Music). Da Pacem is a plea for peace that gives you and your choir a huge range of tempi, moods, dynamics, and textures with which to express yourselves. Morning Bells (3 – 6 part treble divisi and piano; Boosey #48020659). Bells is a great concert opener, an “outburst of optimism and brightness” with vibrant, infectious energy, written by a young Israeli composer championed by Steve Reich. Dance Ablaze! (ssa divisi a cappella; earthsongs). A gifted American composer with a fresh voice. The Nightingale (a one act opera for treble ssaa and chamber orchestra; Boosey rental). Based on Hans Christian Andersen’s tale of the same name, this moving and gratifying 50-minute work puts the focus on the chorus, which plays several different parts. Solo baritone and tenor are the Emperor and the figure of Death. Solo dancer portrays the nightingale. Anima commissioned this for our 40th anniversary season. And it Shall Come to Pass (Is. 2:2-4, 52:7; satb, B solo, harp, tpt; IMI: Israel Music Institute). This is an exemplary piece, fascinating and diverse in its character, dramatic and communicative, and well-written for a mixed choir. It can be performed with piano playing the harp part. Jephtha’s Daughter (Judges 11; satb, S & B solo, horn; Or-Tav Pubs.). Harlap is one of Israel’s promising composers. His writing is sensitive with attentive emphasis on text meanings, thus bringing out the biblical drama at its best. A demanding piece of high quality. One More Winter Ploughs the Sea (Nathan Yonathan; satb; pub. by composer bateyal@bezeqint.net). With a text by one of Israel’s leading poets, this short piece has a wonderful melody and harmony and a pleasant impressionist atmosphere. Ama Namin / Pater Noster (versions in either Tagalog or Latin; satb divisi; score via composer: fidel2163@hotmail.com). Calalang’s score is an exquisite setting of the Lord’s Prayer with expressive textural, harmonic, and dynamic changes that surprise both the singers and the audience. 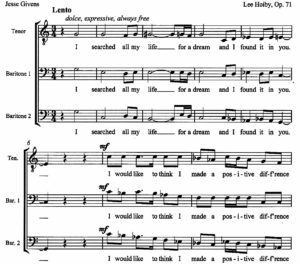 The More I See You (SATB, alto solo; llapin@miami.edu). Lapin’s arrangement is a wonderful blending of unity and jazz textures, combining simple melodic expression with fresh jazz harmonies. Endless Song (text: Sara Carruth; satb divisi, violin solo; score via composer: trilogy@junction.net). Text “I Sing to sow the seed; to share the life music gave to me” resonates with anyone who has felt the magnetic force that binds us as singers and reaches outward, drawing in the listener. 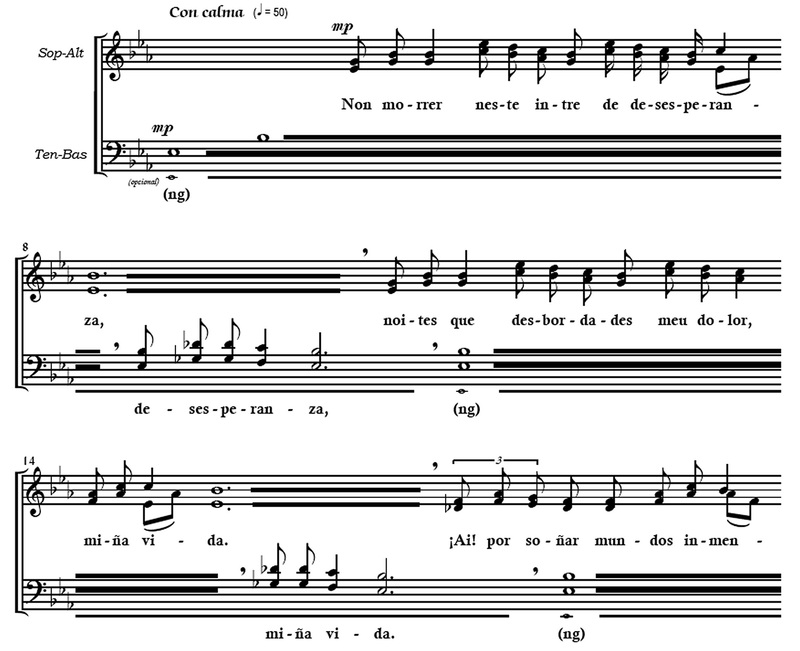 Pater Noster (satb; A Coeur Joie). This score is not too complicated, yet it has an effective contemporary sound. Arroz Con Leche (satb; Kjos). This upbeat and light score also has a fantastic little fugue. Tres Epitafios (satb; Peer International). 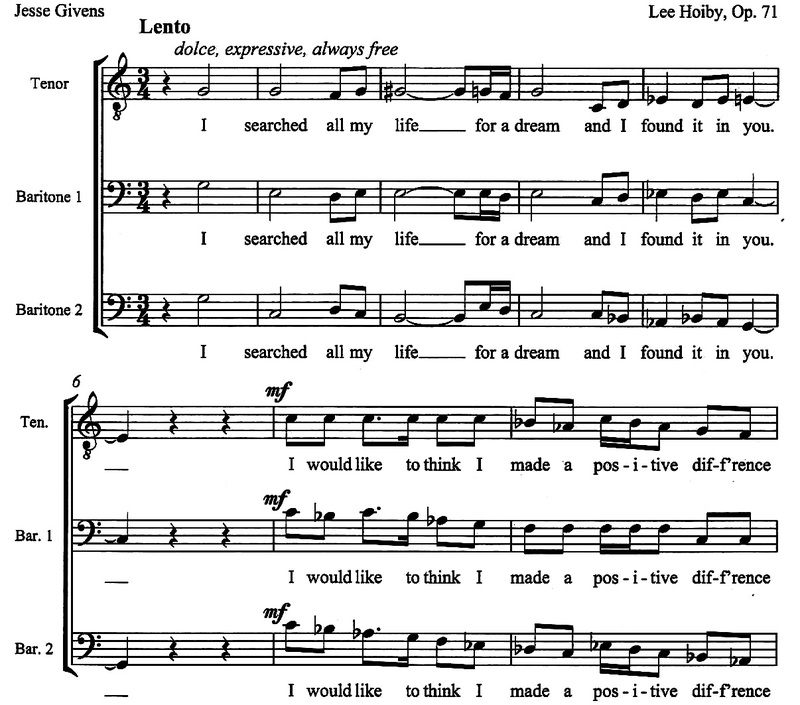 A suite of 3 fantastic little pieces with a range of choral colors and harmonic idioms. 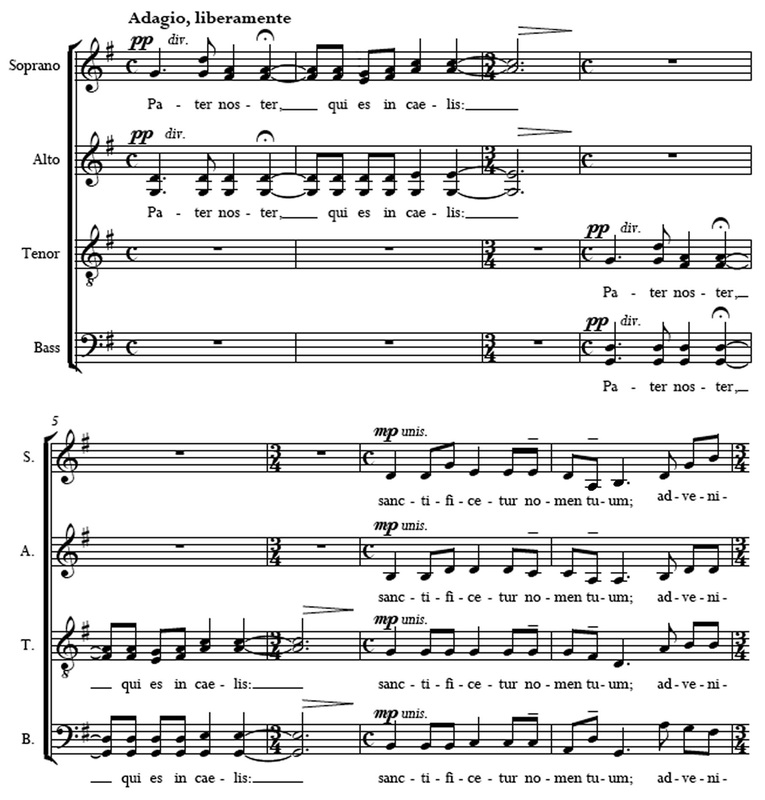 Jing-ga-lye-ja (ttbb or satb, Cypress Choral Music- http://bit.ly/SledJing). A brilliant and fun nonsense song that your audience will love. The work was discovered at one of Chor Leoni’s New Compositions Workshops. As soon as we read through it, the choir said “We’re singing this!” It’s a terrific, fast, rhythmic challenge – count like mad! – and it’s a blast to sing. Agneau de Dieu (satb divisi, satb soli; Boosey M-051473342). Director of the Cathedral Choir, Rupert wrote this for us to sing as part of the entrance requirements for the CBC Choral Competition, which included a choral work in French by a Canadian composer. It calls for a wonderful soaring tenor solo at the end. It’s lush, moving, and not easy, but completely rewarding. The Promise of Living (satbb, piano 4-hands; Boosey M-051450206). Provided you’ve got 2 fabulous pianists, this work is amazing. We’ve sung it at Thanksgiving services at the Cathedral to great effect. The opening can also make a lovely tenor solo, or be sung tutti with great results. Ubi Caritas (ssaa or satb, Walton Music). The text is set so purely and offers beauty of line within the melodic structure. It soothes the soul. Kasar Mie La Gaji (text: “the earth is tired”; ssaa or satb, earthsongs music) . There is everything in this piece! It’s like a mini opera with sections where the people tell the story and then earth’s reptiles speak back, followed by the earth itself moving through the singers. I Thank You God (text: e.e. cummings; ssa, piano or ssatb, piano; ECS/E.C.Schirmer). I would recommend this because every time I have done the piece, it affects the singers in ways that are truly due to the power of music. It’s not something I can put my finger on, but it happens every time! This piece gets in your soul and grabs on tight. 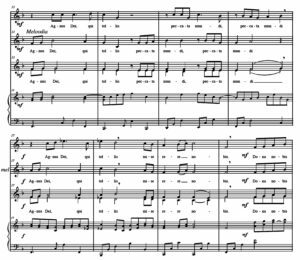 Magnificat (satb, org; Boosey M-060064418). This score is majestic and moving, with varied textures, some passages for a solo quartet, and a wonderful organ part. Celia (satb, piano, earthsongs). I just love this piece! It makes me happy every time I hear it, with its beautifully shaped phrases, Hawley’s trademark harmonic language, and an ebullient piano part. Song of Perfect Propriety (SSA, piano, earthsongs). A very clever and entertaining setting of a wonderful Dorothy Parker text. My choir loved singing it and adding gestures to highlight the text. They had a ball and audiences loved it. (Philippines; Tour Coordinator & Singer, Ateneo de Manila College Glee Club; Singer, Ateneo Chamber Singers). Pange Lingua Suite (satb, http://www.johnpamintuan.com/). Singer-friendly score and great sounding music. Pundayaw (text- Mark 4:20; satb, score via composer: eudyplr@yahoo.com). It’s just magnificent how the composer recreates the soundscape of the text, not only by localizing the translation of the text, but with the sound of his works as well. Misa (satb, http://themusicschoolofryancayabyab.weebly.com/). This is a technically challenging mass setting that incorporates the traditional Latin text in combination with a taste of traditional Filipino music. Hällilaul/Lullaby (SSA; contact composer: timo@helilooja.ee). Nice, simple piece with a beautiful melody from a young and promising Estonian composer. As it is vocalise, it is easy to learn in any country! Sanctus/Benedictus from Mass #5 (satb + organ/piano or orchestra; Edition 49). A monumental work, but not difficult to learn. Choristers love this piece! And the bolero imitation is quite fine. 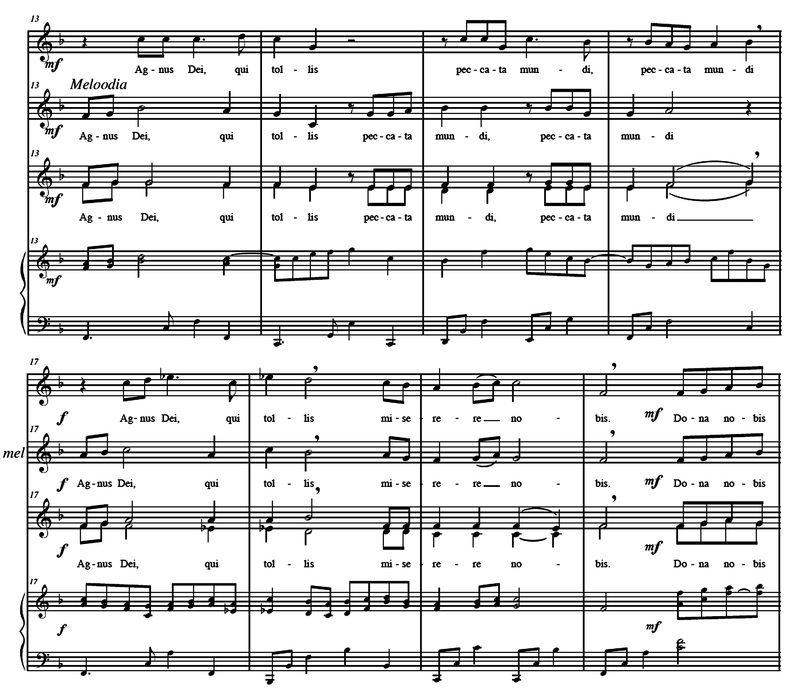 Agnus Dei from Missa Brevis (ssa or ssaa or satb; contact composer: piret.rips@mail.ee). Nice score with a beautiful melody. Children’s choirs are sometimes lacking sacred repertory. This is a piece they like and is easy to learn. 4 Taaveti Laulu / 4 Psalms of David (satb; SPMuusikaprojeck / http://bit.ly/gagkTn). Kreek’s settings have a gorgeous harmonic language, and Estonian is a beautiful and easy language to sing. A Boy was Born (15th-century anonymous British poetry; ssaattbb; Oxford Univ. Press #145). This is a substantial (30 minutes duration; theme and six variations) and extremely well-crafted early work by the 20th-century master that is not as well known as many of his other works. It’s a real tour-de-force for choirs and deserves more performances. 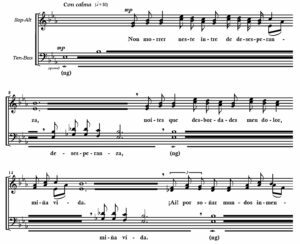 Magnificat (satb x satb; Collegium Music Publications, CCS 212). This is an excellent composition that’s fun to sing. It pairs well with the Bach motets or Bach Magnificat. Magnificat (satb div., Edition Fazer/Gehrman). This is a magnificent, visionary piece that contains multitudes. It’s demanding but extremely rewarding. Landet som icke är (poems of Edith Södergran, ssa div, Mz solo + pf; Edition Fazer). This score is a wonderful adventure, with brilliant poems, and an excellent balance between tradition and modernism. The piano part is a delight in itself. Siell’ on kauan jo kukkineet omenapuut (text: V.A. Koskenniemi; satb div. ; Sulasol). From the greatest national-romantic choral composer Finland ever produced, this score is quintessentially Finnish: full of longing, sadness and tenderness. Please feel free to contact me with your suggestions of scores, composers or repertoire topics (mdolan@aya.yale.edu).